Next month director Thomas de Mallet Burgess presents Milhaud’s opera Médée at Fremantle Arts Centre. Thomas’s new opera company Lost & Found has been making waves in Perth’s arts scene with their productions of unknown operas in unusual places. 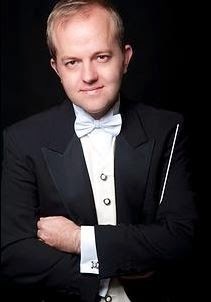 With his international background and commitment to transforming stuffy opera experiences for Perth audiences, Thomas makes a fascinating interview for the Celebrity Soft Spot series. Handel and Vivaldi both useful substitutes for adrenaline fueled activity; the Smiths for time travel; Everything but the Girl for nostalgia and Edith Piaf as a call to arms. Gregorian chant and Billy Holiday. The sky at night. Aside from that, it’s all in the breath. How were you lured to take up a desk job in Joondalup? What did it take for your wife Fiona McAndrew (Perth-born soprano) to convince you to move here in 2012? Fiona and I lived in London for some thirteen years before heading off to the US for four years and then Ireland for seven years. Perhaps there is a pattern of movement developing here? Until now, I hadn’t seen where Fiona had effectively grown-up and that is part of a person’s language of reference. The collapse of the economy in Ireland and the limited opportunities it offered was also a useful prompt. At the City of Joondalup, I have a team of nine experts in the field of performing arts, visual arts and events. As the City of Joondalup is an emerging community this team has a responsibility to develop and deliver creative programmes. This is a far cry from simply funding projects. We have to create them. Many of us also work in our respective creative fields (directing, acting, sculpting, photography etc.). At the City of Joondalup I have an opportunity to work across disciplines (contemporary art, fashion, music) in a way that is stimulating and feeds into other projects. You have spent decades roaming opera companies in various roles (artistic director Wexford Opera House, director of various operas at Convent Garden, Opera Ireland, Canadian Opera Company, Edinburgh Festival). Was it dissatisfaction with the status quo or a vision in the night or something else that inspired you to found LOST & FOUNDopera company? Before leaving for Perth I had directed a production of Handel’s ’Semele’ – challengingly part opera and part oratorio – at St. Werburgh’s Church in Dublin. Not only was this the church where Handel played the organ during his period in Dublin for the premiere of ‘The Messiah’ (across the road in Fishamble St.) but it perfectly suited the dichotomy of the work. The moments of oratorio were imbued with a sacred context and sung from the choir loft while the profane antics of the characters on earth were rendered more shocking as these sections were staged in front of the altar. All this was embedded in a culture waking up to the realization that it that had sold its soul to Mammon. It was hugely well received by the audience who sat in the pews – opera goers and church patrons at the same time. At the time I thought, I’m going to start a company that explores the resonance between a work and the space in which it is performed. The notes I made at the time formed the basis for Lost & Found’s Mission. I have a host of ideas in play. Lost & Found’s first production of Poulenc’s ‘La Voix humaine’ set in a small hotel room was actually Fiona’s idea and I then developed the ritual around this. ‘The Emperor of Atlantis’ was a piece I had been looking to do for some time and it was an opportunity to connect with the Jewish community in Perth looking to explore the resonances of performing this work in a synagogue. One can never be sure precisely what resonances will emerge between work and space. That makes the work so unpredictable and exciting. Audiences in Perth are protectively proud of our state opera company. What made you (and co-founder Chris van Tuinen) think there was room for another opera company? When I arrived in Perth, I had a notion to start an opera company. Then I had a chance meeting with Chris van Tuinen who was also thinking of setting up an opera company that worked on a smaller scale exploring the link between music and drama and bringing the audience up close and personal. Between us we saw the opportunity for audiences to engage with music drama in a more visceral way than is possible in a 19th century opera house and where the traditional relationship between performer, orchestra and audience is re-invented. 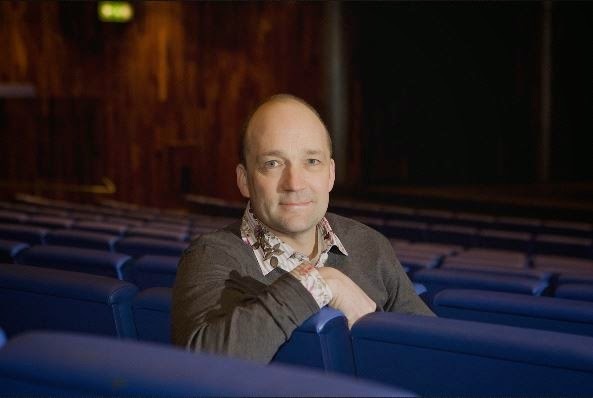 Your name sounds a little English, a lot French, and yet you’ve recently been living in Ireland as director of Wexford Opera House. What are your origins? The highest concentration of my maternal DNA is not to be found in England where I was born or France from where my name comes but rather Northern Libya, Albania and Bangalore in India. “Opera needs to diversify in scale again,” American opera director Peter Sellars said in a recent interview. “It wasn’t always this elephant. It was quite light on its feet for a lot of its history and I think we need to be in that mode again… the next generation is looking to buy their vegetables at a farmers’ market, not a supermarket; they want that taste, that crunch, that flavour. I think they’re looking for more intimate musical experiences where you’re close enough to taste the quality of the work.” What is your vision for opera in the 21st century? My artistic ambition is always to bring artists and audiences into an unexpected and intimate contact with opera, discovering new associations between character, music, text, movement and space and where the relationship between singing actors and instrumentalists is central to the presentation of an integrated music drama. Paradoxically, I found that the more successful I was becoming as a director (bigger houses more resources) the further I was getting from what I wanted to achieve artistically. I am interested in productions that reflect a poetic reality with mentally and emotionally engaged characters trapped in situations from which conflicts arise that in turn engage the empathy and emotions of the audience. I am less concerned with finding contemporary parallels for these situations (this is the work of the audience) and more concerned with extensions of dream and myth that engage the audience at instinctive and primal levels. For the moment I am particularly interested in the interpretative possibilities that may be offered by staging operas in unconventional spaces (for example, warehouse, asylum, church, train station, port). I am also interested in new work that is developed musically and dramatically through collaboration. You have a soft spot for neglected operas. What is the appeal of this repertoire? I have very fond memories of directing at the world-famous Wexford Opera Festival (a visit to which has to be one of the most wonderful experiences for anyone interested in opera) and of course this is a festival that specialises in neglected repertoire: ‘Alessandro Stradella’ by von Flotow and ‘La Vestale’ by Mercadante. What a challenge these pieces were! Unfamiliar repertoire offers an opportunity to breath creatively away from considering how to approach the mainstream titles for the fourth or fifth time. There are few schools for opera directors. How did you learn your trade? When I graduated from Oxford there were only two schools I was aware of that taught any sort of directing course. Bristol Old Vic I found too snobby and Yale too expensive. As a result I learned the hard way. An apprenticeship as an Assistant Director at Covent Garden (hated being an assistant – it isn’t in my DNA). Mistakes. Many of them. All this from a base that the first opera I listened to was also the first opera I directed. Only three years ago did I begin to believe I knew how to direct opera. And I’m still learning. Where do you get your inspired production ideas, for example the decision to set Viktor Ullmann’s The Emperor of Atlantis in Perth Hebrew Synagogue around a rusted Volkswagen? 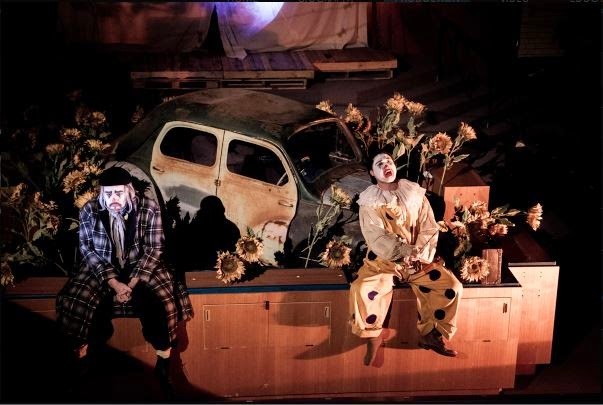 In fact cars are becoming a theme; Menotti’s The Telephone (from the award-winning 2015 Fringe World triple bill) featured an Alpha Romeo convertible as a prop. I research heavily and listen intuitively, possibly beyond this life. You are also the author of “The Singing and Acting Handbook” (Routledge, London and New York) which is used worldwide including at the WA Academy of Performing Arts. What makes this book so groundbreaking? It recognises that the acting training for a singing actor must necessarily be different from the acting training for a speaking actor. Everything else follows from this one simple fact. Your wife Fiona performs in many of your productions. Are your two daughters also opera stars in the making, or perhaps a conductor and repetiteur to complete the production team? Iseult and Beatrice will plough their own course. Both are musical but have many other talents also. They will both feature in Lost & Found’s upcoming ‘Médée’ – the whole family exploring infanticide. We’ll probably need group therapy afterwards. Whilst it might appear from a Perth perspective that Fiona and I work a lot together that is not the case when considered from a broader perspective. We collaborated on ‘Dead Man Walking’ for Opera Ireland but apart from that haven’t worked that much together before arriving in Perth. For example, we both worked for Wexford Festival Opera but on very different occasions. Fiona has very kindly supported Lost & Found in its earliest days to produce a quality of performance that helps define the Company’s uniqueness. You have been invited to direct Pinchgut Opera’s production of Vivaldi’s Bazajet with Pinchgut Opera in July (Sydney) but first is Médée in May, set in the Fremantle Arts Centre. What can we expect? Taken from the final sections of the ancient Greek tragedy Medea, Médée explores a woman’s psychological state as it shifts from the contemplation of marital infidelity to exacting revenge and, in a chilling climax to the slowly wrought catharsis, the murder of her two children. The compression of the action into three tableaux coupled with Milhaud’s economical music played by a chamber ensemble make for a compelling operatic tragedy. FAC’s history as first a lunatic asylum and later a women’s home makes it an apt staging point. Performed in a room that contains one of the asylum’s original cells, with a limited capacity of fifty people, this promises to be an intimate and haunting production. Excellent company, fine wine, French language and culture, English language and literature, water slides. Online or directly from the publisher unless you are in London and then at most good bookshops with a drama section! Thank you Thomas de Mallet Burgess for making time for Celebrity Soft Spot. For more info on the director go to http://demalletburgess.com. Tickets for Milhaud’s Médée at the Fremantle Arts Centre are selling fast. Click here for more details.